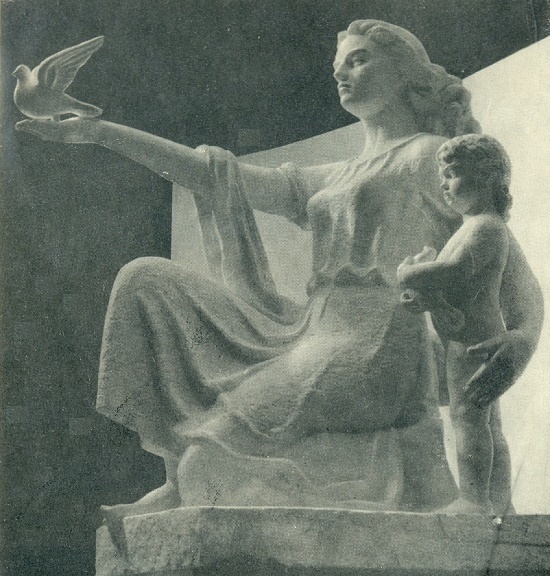 A beautiful young woman with a smooth, broad gesture holds out the dove of peace to people. 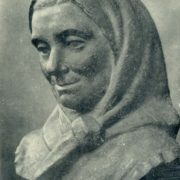 Beautifully, severely and gently is her face, the simple open face of a Lithuanian peasant woman, with a proud profile and severely curved eyebrows. The wind throws a thick wave of hair. A light dress encircles a strong body. 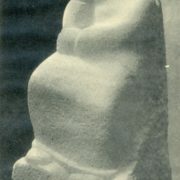 She holds the child with a gentle movement of the hand. 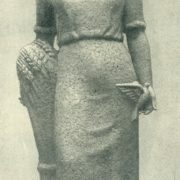 This sculpture has different names – “Peace”, “Mother”, and “Lithuania”. Its author is Yuozas Mikenas. The path of Juozas Mikenas to art was difficult and complex, the same difficult and complex as the whole life of the artist in bourgeois Lithuania was. Born February 12, 1901, he grew up in that stern, miserly and beautiful land, on the very border with Latvia, in the peasant family. Childhood remained in his memory with the few clear pictures that made up the world of a peasant boy. It was work in the field, the simple duties of a small shepherd, rural evenings with their clear silence, warm earth under bare feet and the most fascinating fishing in the world. The only city he knew was Aknist: about three hundred residents, two or three shops, a pharmacy, and a church. There he and his brother went to school every day – six kilometers on foot. His father tried to give the children a good education, and when Yuozas graduated from primary school, he took him to Jakobpils and brough him to the local gymnasium. But Mikenas could not finish it. The first world war was rushing, and, escaping from occupation, the family of Mikenas moved to Russia. Yuozas was fourteen years old when the life of a refugee began for him. Destiny threw him first to Moscow, then to Vyazma, and, finally, to Voronezh. 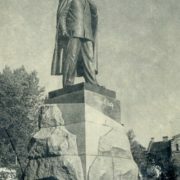 In Voronezh, he learned the news about the revolution in Petrograd. It entered the life of a small Lithuanian colony with bright flashes of posters, riotous rallies, the noise of street demonstrations, and the awakening of hopes for a creation of free Lithuania. After graduating from the gymnasium in Voronezh in 1917, Mikenas went to Odessa, dreaming to continue his education there, to get a specialty. Mykeneas enters the hydrotechnical school, but he could not study. Civil war begins. Mikenas had to work as a loader at the port, saw wood, perform the most difficult and hard work, and starve when there was no work. But it was in this difficult year of 1918 that art entered the life of Mikenas for the first time. 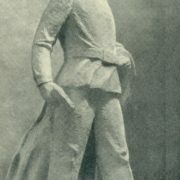 Forgetting about fatigue and hunger, he was very enthusiastic at an amateur theater created in Odessa after the October Revolution by a group of refugees – Lithuanian intellectuals. From the theater began the creative life of Mikenas. 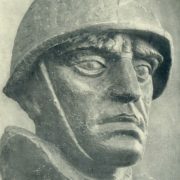 After the capture of Odessa by the Whiteguards, Mikenas with great difficulty managed to escape from the occupied city and return to Lithuania. 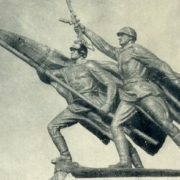 The Soviet government gave the people of Lithuania freedom, land, and peace. The country began a great cultural revolution. 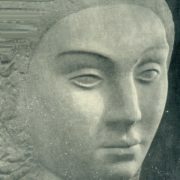 Theaters, art collections became the property of the whole people, and appeared the first Lithuanian state art museum. The decree of March 13, 1919 revived the Vilnius University. In February 1919, the first studio of drawing and painting in Vilnius opened its doors for the public. Eeventually, it had to grow into the Art Academy of Free Workers. 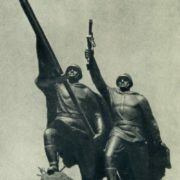 In Soviet Lithuania, the implementation of the Leninist plan for monumental propaganda began. Echoes of great revolutionary events have reached both the Aknisty and the Scardupis peasant farm. 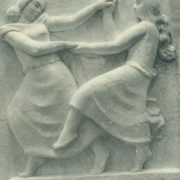 With the active participation of local peasant youth, the first in the history of the region amateur theater opened here. The initiator of this event was Yuozas Mikenas. Interestingly, at first he staged plays in his father’s house. They had such success that he decided to move the theater decided to the city. This theater, founded in 1919 in Aknist, was one of the first Lithuanian national theaters, and Mikenas was its director, actor, and artist. 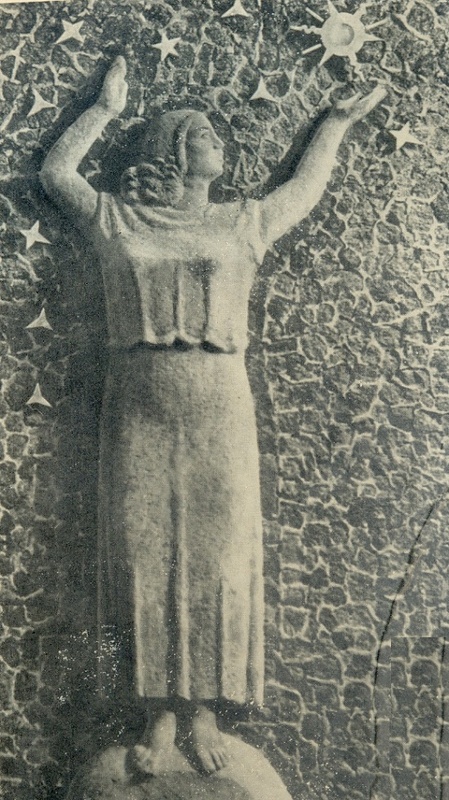 The theater’s decorations were the first works of fine art created by Mikenas in conjunction with his older brother Jonas. In 1919, the combined forces of counterrevolution and intervention succeeded in strangling the young Lithuanian republic of workers and peasants. A black veil of reaction, bourgeois dictatorship and arbitrariness, has fallen over Lithuania. The theater in Akniste did not last long. In search of earnings in the winter of 1919, Mikenas left Skardupis. One year he worked as a teacher in the small town of Paiamemunelis. And a year later he completely left his native places and moved to Kaunas, where he got a job at the railway administration. Dull and tedious work could lead to despair if Mikenas failed to return to the scene. In Kaunas appeared the theater studio Sutkus. It was an amateur theater of humor and satire, which preserved the best features in the native theaters of the era of the revolution. In the evenings, in free from service hours, Mikenas enthusiastically attended studio sessions, studied stage skills, history and theory of theatrical art. However, it soon became clear to him that he was not successful on the stage. This discovery Mikenas made himself, and may be, earlier than the audience. And no matter how strong his love for the scene was, he left it forever. But Mikenas could no longer live without art. Since 1921, he began to attend art courses of Y. Venozhinskis. 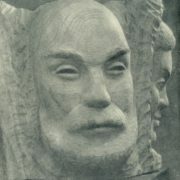 Excellent teacher, Yu Venozhniskis managed to awaken the talent of Mikenas-artist, instill in him the love of fine art. When in 1922 the courses were transformed into an art school, Mikenas entered it one of the first. In Kaunas school, in the studio of painting Yu. Venozhinskis, he mastered the high skill of drawing, and studied the anatomy perfectly. Besides, a wonderful Lithuanian watercolorist K Shklyus tought him watercolor lessons, and since that and for all his life Mikenas loved the watercolor. 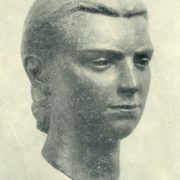 In addition, in Kaunas school Mikenas discovered the great artistic value of Lithuanian folk plastic, which traditions later became the main source of his creativity, his aesthetic ideals. 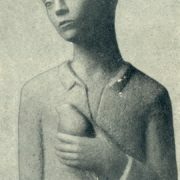 In 1926, Mikenas graduated with honors from the Kaunas Art School and, among its best graduates, went to a foreign trip for one year. Later in the autumn of 1926 he left for Paris. This first trip to Paris was a general acquaintance with the art of the French capital. Mikenas studied collections of museums, attended exhibitions, and art studios of academies. 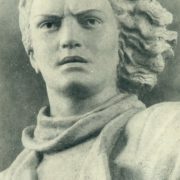 In Paris, he met with the studio of the Russian artist V. Shukhaev, from Lotte’s studio, with the work of his senior fellow Lithuanian sculptor V Gribas, who in 1927 worked at Bourdelle. With wide eyes Mikenas peered into Parisian art life, trying as much as possible to understand, see, and find. Also, his Parisian watercolors in 1927 have a genuine artistic value. In fact, in the art of watercolor Mikenas in the years 1927-1928 attains high skill. His works are acquired even for foreign European collections. Time passed quickly in Paris. The money allotted for the trip was over, and in 1927 Mikenas returned to his homeland. Here he had to face directly the brutal system that established in Lithuania after the fascist coup in December 1926. A talented artist could not find work. He searched in vain for the teacher’s place, pestered the thresholds of institutions. With difficulty, Mikenas managed to get permission to travel abroad: in his homeland, he could not find an application for his art. Besides, the artist did not have money to travel. And it was only thanks to the financial assistance of his elder brother that Mikenas could again go to Paris in the winter of 1927-28, where he lived almost continuously until 1931. In Paris, Mikenas entered the Higher State School of Decorative Arts, then moved to a more interesting school for him – the National Conservatory of Arts and Crafts. There, for three years, he specialized in mosaic and mural. Admitted to the conservatory, he studied successfully. 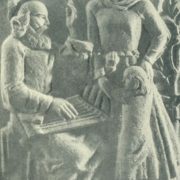 Along with mosaic and fresco, he studied monumental and decorative art, architecture, and synthesis problems. But the real creative work began for Mikenas outside the conservatory, in those private academies and studios that had much more significance for the artistic life of Paris than the official schools. 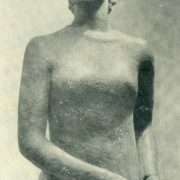 In the studio of M. Lenoir, he studied the technique of fresco, and at the Academy of Julien in 1928, he first began to engage in sculpture. 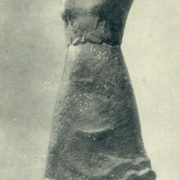 Mycenaez’s first appeal to sculpture was caused only by the desire to improve his drawing, to feel the volume, the plastic of the form more sharply. 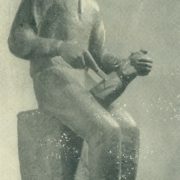 But soon the sculpture attracted him with great force. In France, Mikenas’s presentation of sculpture expanded considerably. After all, the Louvre was near. 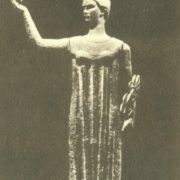 With masterpieces of Ancient Egypt and Greek archaic. 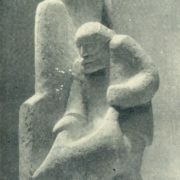 Ancient Greek plastics, perhaps, just as much as Lithuanian folk sculpture, became the source of Mikenas’ strongest aesthetic experiences. And the sculptors of the twentieth century, Roden, Burdel, and Maillol had the strongest impact on him. 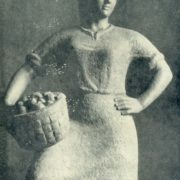 Besides, the direct influence were the remarkable masters of French realistic sculpture, S. Despio and M. Gimon. In 1928-1929, he received first prizes for his sculptural works at academic competitions. 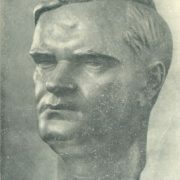 With enthusiasm he creates portrait heads and busts, compositions, the first designs of the monument to the great Lithuanian prince Vytautas, the hero of the Grunwald battle of 1410. 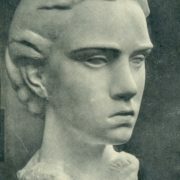 Every day of Mikenas’ life in Paris is full of intense study and work, and his success in sculpture is very significant. 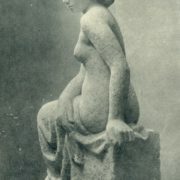 Thus, in 1928-1930 the young Mikenas, along with the leading masters of French sculpture, took part in the Paris exhibitions of the “Autumn Salon”. 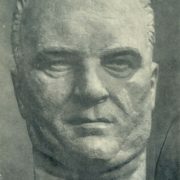 His sculptural works appeared at international exhibitions: in 1929 – in Barcelona, ​​and in 1930 – in Liege. In 1931, Mikenas returned from Paris to his homeland with a colossal reserve of indelible impressions. His name has already received European fame. Meanwhile, from this time begins the pedagogical activity of Mikenas in the Kaunas Art School. 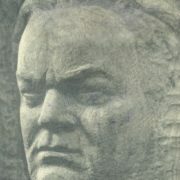 He showed a lot of perseverance, persevering will, creative enthusiasm in order to achieve the creation of a branch of decorative sculpture in the Kaunas school. 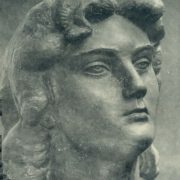 In order to study the methods of teaching monumental and decorative sculpture in other countries, he travels to Latvia, Estonia, Finland, gets acquainted with the program of the Latvian Academy of Arts and the Tartu Art School “Pallas”. 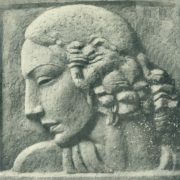 Having headed the studio of decorative sculpture in the Kaunas Art School, Mikenas seeks to instill in his students a love of working in hard materials, understanding the logic and structure of the image in sculpture. Mikenas’s social and pedagogical activity is also multifaceted and fruitful. Among his merits and titles: laureate of the State Prize of the USSR, since 1947 a deputy of the Supreme Soviet of the Lithuanian SSR, People’s Artist of the USSR, corresponding member of the USSR Academy of Arts, member of the Board of the Union of Artists of the USSR. 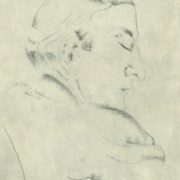 A professor, until 1961, head of the Department of Sculpture of the Art Institute. 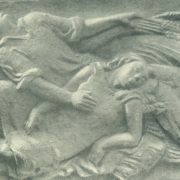 Mikenas is a sensitive, talented teacher who brought up a generation of Lithuanian sculptors. 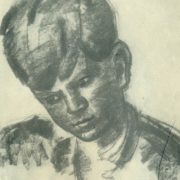 At the heart of his pedagogical method is an individual approach to each student, respect for the work of a young artist, and the ability to find in each pupil the uniqueness and strength of his talent. For more than thirty years Mikenas devoted to pedagogical work, and the fruits of this work – in the success of the sculpture of Soviet Lithuania, in the heyday of its young talents. The monumental school of Mikenas is one of the largest phenomena of the national culture. 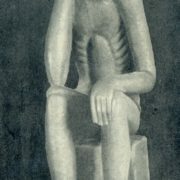 And every Lithuanian Soviet sculptor – from an associate professor to just a student, considers himself a disciple of Mikenas.